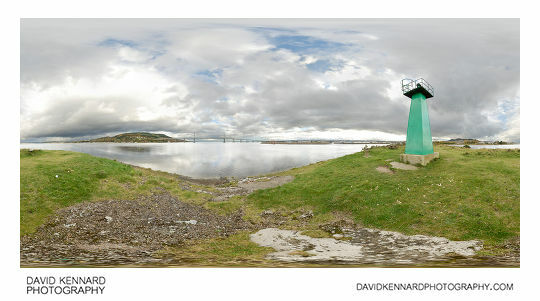 I recently finished processing some panos of Inverness. I took these on a walk through Inverness while I was on holiday in Scotland in October 2011. This first one is from Clachnaharry Works Lock, which is on the Caledonian Canal. The canal runs across Scotland, linking Inverness on the east coast to Corpach on the west coast. 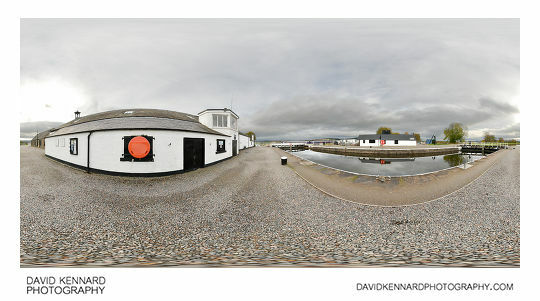 The Works Loch is interesting in that it has a railway swing bridge at one end of the Loch (you can see a train crossing the bridge in the pano). Carrying on along the canal, you come to the Clachnaharry Sea Lock, where the canal joins the Beauly Firth. 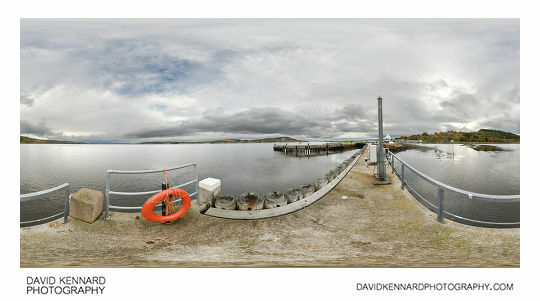 The pano above was taken at the end of a jetty slightly further on from the Lock. Apparently they had to use some innovative techniques in constructing the lock, which was constructed from 1808 until completion in 1812. Because the mud was very soft, they had to build one large embankment and leave it to sink into the mud. After it had finished settling, they then excavated the middle for the lock. We had our lunch nearby, where a gentleman pointed out some dolphins swimming along the firth. I didn't have a long lens for getting any photos of them though. A bit further along, and a lady pointed out a seal. Seems there is lots of marine wildlife in Inverness. This is Carnac point, a small strip of land that juts out into the firth. To the south-east is the end of the River Ness (Abhainn Nis). The main (only) feature of Carnac Point is the green light tower, which is covered with scrawlings in permanent marker. Above is Inverness Castle, which is currently used as a Sheriff Court. I was rather disappointed that it is quite a modern building (1836) and you can't look round it either. It's not really what I would envision when I think of a castle. To me it seems more like a stately home built in the style of a castle. 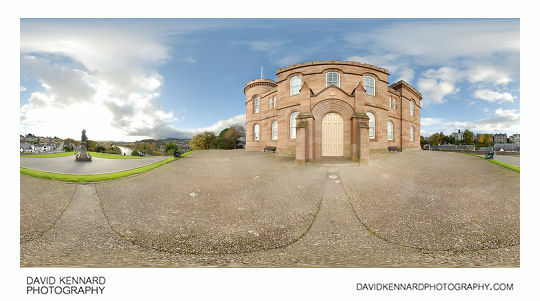 There were lots of other interesting buildings in Inverness, but I didn't take any more panos than the above. I did take some normal photos, but they will have to wait for now. I still have most of my Japan 2009 photos and loads of flora and fauna photos from the past few years to get through yet.